Honey Bees become a big nuisance and threat for human beings and other animals when they start inhabiting localities in abnormally large numbers. Often, this results in unwanted encounters, which are typically not pleasing experiences. What's more, these encounters can turn fatal for the victims of Honey Bee attack. Such a situation presents a typical case of Honey Bee Infestation: Bees start building their hives in almost every possible place; in cracks of walls, in attics, in boxes, in pipes, in ventilators, in shades, on trees in your garden, in garages and every place you can think of and that has been untouched for a few days. Bees become a problem and require removal due to their venomous sting and their highly aggressive nature. At the slightest hint of any danger, mayhem can break loose and thousands of bees swarm in and attack whoever or whatever catches their sight. The intensity of pain from these stings depends upon the amount of Apitoxin they release and the intensity of the toxin. The biggest problem with Honey Bees is that you cannot fight them when attacked. 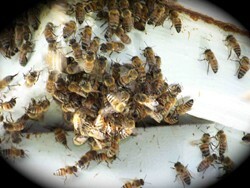 They are so small, so fast and so numerous, that the victim will be stung dozens of times within a matter of seconds. Although an average healthy person can withstand as many as ten stings per pound of his body weight; this can be fatal if the person is allergic to honey bees, bee stings and bee venom. Even a few stings can trigger severe allergic reactions in the body and the victim can collapse. Then, there is the pain. In most cases, victims don't die from large quantities of venom introduced into the body, but from the acute pain that causes cardiac arrest. Honey Bee Infestation can be really a big problem. Call Knott's today for your complete Bee Removal Solution!